Mihaylo alumna Michelle Kop ’14 (marketing) is a search supervisor at Saatchi & Saatchi, one of the top advertising agencies in the world. This company is known for its bold and creative advertisements for clients such as Toyota, ASICS and the Los Angeles Chargers. Just a few years after graduating from Cal State Fullerton, Kop first joined Saatchi & Saatchi as a search strategist. 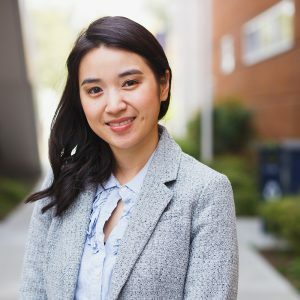 In this guest article, Kop discusses her career immediately after graduation, from working in a small digital marketing agency to her current role at Saatchi & Saatchi, and her constant efforts to improve as a marketing professional. Touching upon the feelings of uncertainty that she experienced in the months leading up to her graduation in 2014, Kop also shares some words of wisdom for students who will be graduating this May. Just a few years ago, I was sitting in a classroom at Mihaylo College. I was going to classes, interning at a local firm, meeting up with friends – and dealing with some pre-graduation jitters. My entire post-college career has been on the agency side of marketing – planning and executing digital media strategies for small local businesses and now Fortune 500 clients. My specialty within the digital marketing field is in search engine marketing, which is what I currently do in my full-time role at Saatchi & Saatchi. Toward the end of my undergrad years, I had feelings of uncertainty and many questions about the future. What’s next for me? How will I be able to put my hard-earned degree to good use? How do I apply myself in the so-called “real world”? Nobody could have predicted how it would unfold for me. I was determined to find the answers myself. This story uncovers what I did, the mistakes I made, and my perspective on how anyone can set themselves up for a successful career after college. I wasn’t serious about finding an internship until the summer of my junior year in college. Curiosity led me to pursue a new area in the marketing world ‒ digital marketing – so I made sure to hone in on this area during my search. Eventually, I was offered an internship at GMR Web Team, a local digital marketing agency. This internship was critical in my career journey because of the “real-world” responsibilities of juggling client accounts and developing digital marketing strategies – and that was the best way for me to learn. After that summer, the internship eventually turned into a part-time position, and I was fortunate enough to continue working there during the school year. To be honest, I was concerned a semester before graduation. I interned at GMR Web Team for about a year and wasn’t sure if I wanted to continue working there after college or if I wanted to move on to another company. They offered me a full-time position after graduation, and I was torn whether to accept it or move on. I made the decision to stay because there was still so much to learn, and there were additional responsibilities given with a new role. Shortly after graduation, I moved into a digital account manager position at GMR Web Team. This role helped me develop client relationships and learn the ins and outs of meeting business goals of clients while executing different marketing campaigns. Working with a team of dedicated senior members was very important in my growth there. There were also several opportunities to attend conferences and get training necessary for professional development. After almost two years full time at GMR and gaining the experience I did, another amazing opportunity presented itself. It was the opportunity to work on the Toyota Motor North America account at Saatchi & Saatchi. Working for Saatchi & Saatchi is truly a privilege. Everyone at the company is dedicated to excellence – coming up with creative ideas and executing them to make a reality for our client, Toyota Motor North America. Currently, I’m a search supervisor as a part of a larger media team that executes and buys media to reach certain campaign objectives. My team plans and oversees the search engine marketing for Toyota’s national campaigns. Search engine marketing (SEM), also known as paid search marketing, is the process of serving ads on search engines and paying when users click on the ad. When users query “Toyota Camry price” on Google, we drive them to the most relevant page on Toyota.com to find the information they’re looking for. An example of a paid ad showing up on a search engine results page. What I personally love about search engine marketing is that there’s intent behind each search. The beauty of it all is that search marketers get the ability to mine through keywords to understand what users are looking for and then give users exactly what they’re searching. It’s the most efficient way to market a product or service because the audience is coming to the advertiser, rather than the advertiser using traditional push marketing to find the right audience. 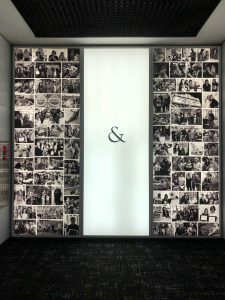 It was very different going from a start-up agency with 15 employees to a large corporate-like agency with about 500 employees. Saatchi feels like an extension of college. Everyone there is very young – the average age is around 27. The culture is very laid-back with no strict dress code. People come to work in ripped jeans and a T-shirt because it’s not so much about how you look or dress, it’s about producing and serving the client. There’s also a dog-friendly policy, and employees are allowed to bring their dogs to work. My favorite part about Saatchi is that leadership fosters the growth of employees by offering a tuition reimbursement program. Every year, a tuition budget is offered to each employee to take courses related to their job. I’ve taken technical courses to sharpen my skills and even joined Toastmasters to help with professional speaking and leadership development within the last year. One thing that I would have changed during my college years would be to develop public speaking skills. 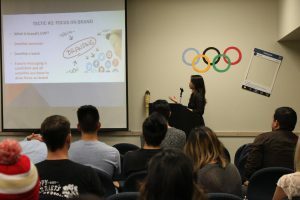 Every single upper division marketing course at CSUF had a group project with a presentation at the end of the semester, and this was a strategic way to prepare students for the business world. While I always took these presentations very seriously, I hated public speaking and always tried to avoid it whenever possible. Being in a professional work environment at one of the biggest advertising agencies in the world, I’ve learned that the most successful leaders know how to speak eloquently. It’s not just about getting in front of a crowd, it’s about having a strong point of view, voicing a bold opinion, and being passionate about various topics even in small group settings. I learned that if I wanted to get to a management level, I would have to find my voice in a team setting and share my point of view with confidence in front of Saatchi management and even senior marketing executives at Toyota. One of my mentors recommended Toastmasters, a club with thousands of chapters around the world, which is committed to helping members develop public speaking and leadership skills. 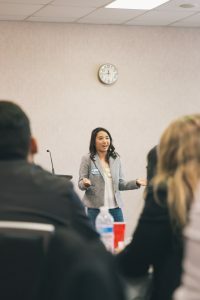 In each meeting, members are required to step outside their comfort zone and share prepared speeches, practice impromptu speaking, and even get valuable, live feedback from more experienced members. It’s in a non-judgemental environment that encourages every member to develop necessary hard and soft skills for the business world. I would highly recommend it to any college student or young professional to practice speaking. It’s a skill humans are not born with and should be practiced as much as possible. Shift your mindset from being just a college student to pushing for more real-world experience outside of the classroom. I wish I would have put less emphasis on getting good grades in school because a good GPA didn’t mean anything in the real world (at least for me). Employers are looking for experience – even in entry-level jobs. Then it goes back to the most commonly asked question: “How can I get experience if I don’t have experience?” The simple answer to that question is to start with an internship. 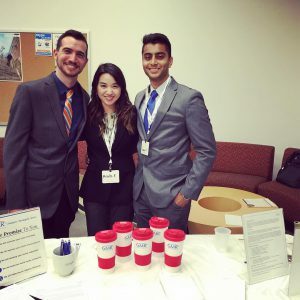 Most internships are unpaid, but there are some paid internships out there (which I would recommend over unpaid), so students can get paid to learn and get experience. It’s a win-win situation. There are various resources on campus, such as the Career Center, professors and their office hours, tutoring center, and even other students. Many students don’t realize how valuable these free resources are and often pass them by. Any student feeling stuck or confused about the next step after college should ask for guidance. I’d recommend joining a club that pertains to a specific major – not just to meet other fellow like-minded individuals but to meet with professionals in that field. For marketing students, I’d recommend the American Marketing Association (AMA). The AMA is committed to bringing in the top employees from Fortune 500 companies to offer insights and tips on the industry. It also organizes conferences and networking events to sharpen business acumen and develop essential skills to be successful in the real world. Find a mentor who has the experience you’re lacking. You’d be surprised to discover just how many individuals are willing to shed some light on how they got to a specific place in their career. Just ask! This has been a critical piece in my career development – I have a handful of mentors within my organization and even outside to give me a different perspective of the industry. Kaizen is the Japanese word for “continuous improvement,” and it is part of The Toyota Way which is a set of principles comprising Toyota’s managerial approach. This is something that is also practiced at Saatchi & Saatchi, and I would recommend everyone adopt this philosophy in life. When college is over and the final grades are delivered, this is not an opportunity to kick back, relax, and stop being a student. Adapt a kaizen approach, and be a student of life. Continue to learn, but this time, learn things you’re actually interested in! There are several free or affordable online academies/training programs that are available on Udemy, Lynda, or even YouTube. Read self-development books and surround yourself with people who are just as interested as you are in a specific topic. You’ll be surprised at how this will help your professional development and take you to levels you didn’t think were attainable. Just continue to sharpen the saw. For more information about the marketing program at Mihaylo College, visit the marketing department at SGMH 5214. The Mihaylo Career Services is also available for any questions about careers in marketing and internship opportunities.